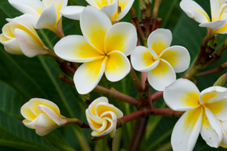 Plant a frangipani tree in your garden or landscape to create a fragrant outdoor paradise. A common species of the plumeria tree is the Plumeria Rubra, also referred to as Frangipini. This plant is native to Mexico, Venezuela, and Central America. Plumeria also grow abundantly in Hawaii, and are a popular flower used to make Hawaiian leis. The frangipani tree will grow up to 25 feet tall, with a spread of 20 to 25 feet wide. The leaves are two to four inches wide, eight to twelve inches in length, and glossy green in color. Frangipani flowers grow in clusters, are 2 to 3 inches in diameter, and consist of five petals that are spiral in shape. Plumeria flowers grow in clusters, and will bloom June through November in USDA hardiness zones 10B through 11. As the plumeria tree grows in height, its branches spread out from the trunk to form a canopy, or umbrella shape. If you live in a cold climate, you can grow plumerias in containers. Containers can be sunk in the ground or stay above ground. They are portable, and can be easily moved indoors during the cold months for over wintering. Location – Store this small tree in a dry, protected location, such as a shed, garage, basement, or attic. Watering – Plumeria fall dormant during the winter, and do not require water. If stored in a warm, dry location, you might want to water once a month. Temperature – Should not be below freezing. Removing From Storage – When temperatures remain above 50 degrees, it’s time to bring plumeria out of winter storage. Place the tree in a warm, sunny location for optimal growth and flowering. The best time to plant plumeria trees is in the spring. Frangipani grows best in tropical and sub-tropical climates. 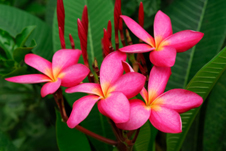 Plumeria flowers produce an exotic fragrance, a perfect addition for outdoor tropical landscapes and gardens. When planted in a container, this tree can be easily moved indoors for over wintering. Plumeria rubra grows in USDA hardiness zones 10B-11. This flowering tree will thrive when planted in rich, organic soil with good drainage. For optimal growth and flowering, plant the plumeria tree in a location that receives direct sunlight. Carefully remove the root ball from the container. If planting more than one frangipani, space trees 20 to 25 feet apart. Water when top two inches of soil feels dry to the touch. Roughly the equivalent of one inch of rain each week. Choose a healthy limb for a cutting. Two or more growing points are ideal. Cut a length of twelve to eighteen inches. With sharp pruning shears, make a clean cut at an angle. Place cutting in a dry location for a minimum of three days to allow the cut end to heal. Plant in a container, using rich, organic potting soil. Remember to steak the cutting. Place container in direct sunlight. It can take up to eight weeks for signs of leaf growth.